Skype on iPhone - what's the big deal? 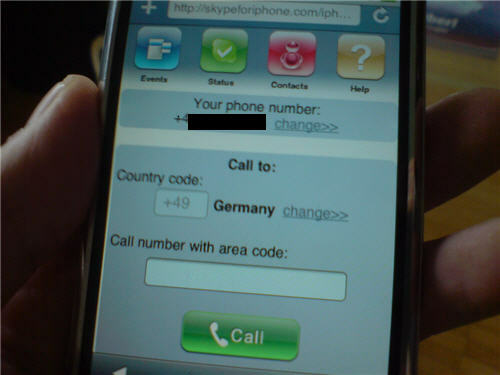 So, as expected, Skype is coming to the iPhone with calls only being made over Wifi. You can dial a number or quickly call a contact stored in your address book. iPod Touch users will need earphones with a mic to talk. The chatting feature is included. During a call you can mute the line, go on hold, or put the call on speakerphone. The ability to accept incoming conference calls. Well, it’s not such a big deal since you can download and install Skype on most new phones/smartphones. I have been using VOIP on my phone for a long time and save a tonne. It’s a given that most new phones will have Skype already installed. The main thing is that alarm bells will be ringing for most mobile phone operators. Will VOIP replace mobile phone networks? YES! email will replace text messaging. As wifi and HSDPA grow it will become more commonplace to use email and VOIP and why wouldn’t you? The possibilities are somewhat endless as apps link and merge together. I hope the iPhone will show how VOIP can be far superior to what we already have. Remember when they said digital TV will change the way we watch TV? Change is coming AT&T, be afraid. This thing does so much, more than can be explained on a simple review. This is the ultimate computer, yes I said computer. It does everything and fits in the palm of your hand. Get it, you will love it. Plus this thing is almost free with a MacBook Pro purchase, just do not expect too much from Apple's Customer support if you buy from Amazon and not Apple.